The extracellular enzyme cyclodextrin glucanotransferase (CGTase) synthesizes cyclic malto-oligosaccharides called cyclodextrins (CDs) from starch and related α-1,4-glucans. CGTases are produced by a variety of bacteria, mainly Bacillus species, by submerged culture in complex medium. CGTases differ in the amount and types of CDs produced. In addition, CGTase production is highly dependent on the strain, medium composition and culture conditions. Therefore we undertook this study with a newly isolated strain of Bacillus circulans. CGTase activity produced from Bacillus circulans DF 9R was optimised in shake flasks using a combination of conventional sequential techniques and statistical experimental design. Effects of nutrients, including several carbon, nitrogen and mineral sources, were assayed. The selected minimal medium consisted of 1.5 % cassava starch, 0.4 % ammonium sulphate, 0.1 M phosphate buffer, 0.002 % MgSO4 and 0.002 % FeSO4. The optimal concentrations of carbon and nitrogen sources were determined using a central composite design. Maximum CGTase activity obtained in supernatants was 5.8 U/mL in 48 h of incubation. Optimal conditions for enzyme production also included an initial pH of 8.3 and 37°C as the incubation temperature. Cell growth and CGTase production profile were not linked to each other, suggesting that enzyme production/secretion is not growth–associated but mainly a late-log phase event. We have screened conditions for optimal CGTase production. The selected minimal medium contained starch, ammonium, Mg2+ and Fe2+ as essential nutrients. As an additional advantage, this medium does not require complex nitrogen sources with varying and unknown composition. The enzyme cyclodextrin glucanotransferase (CGTase; 2.4.1.19) synthesizes cyclic malto-oligosaccharides called cyclodextrins (CDs) from starch and related α-1,4-glucans. CDs are high value modified starches ($20–$500/kg) useful as molecular chelating agents. They have the ability to form inclusion complexes with a wide range of molecules, changing their physical and chemical properties, and are therefore used in food, agricultural, chemical, cosmetic and pharmaceutical industries [1–3]. CDs belong to three major groups called α, β or γ CD, with 6, 7 and 8 glucopyranose units respectively, linked by α (1→4) glycosidic bond. All known CGTases produce a mixture of α, β and γ CDs, in different ratios. CGTases are predominantly extracellular enzymes, produced by a variety of bacteria, mainly by Bacillus, but also by Klebsiella, Micrococcus, Thermoanaerobacterium and others [4–6]. We have isolated from rotten potatoes the strain Bacillus circulans DF 9R, producing CGTase . The enzyme has been purified to homogeneity and also characterized in relation to Mw (78 kDa, estimated by SDS-PAGE) and other properties, such as pI and thermal stability . Conventionally, CGTases have been produced by submerged fermentation in media containing various types of starch or other carbohydrates, and complex nitrogen sources [9–13]. However, the overall information about fermentation conditions and process optimisation has been scarce. In addition, several authors reported variable CGTase yields, depending on strain, medium composition and culture conditions [4, 14, 15]; therefore we undertook this study with the newly isolated strain. We have used conventional methods of medium optimisation (variation of one factor at a time) and also statistical experimental designs [16, 17], which allow the simultaneous variation of several components and levels. Results were analyzed by linear regression and ANOVA, in order to select statistically significant effects and also modeling the response to find the optimal conditions. The selected medium is suitable for the production of CGTase activity in well-defined conditions, with the additional advantage that no complex nitrogen sources with varying or unknown composition are required. The effect of different carbon sources on growth and CGTase activity produced in shake flasks was assayed by substituting soluble starch in the basal medium with various carbon sources. Simple carbon sources, including glucose, α-CD, β-CD, xylose and maltose were not able to support growth of the organism, and enzyme could be produced only when starches were present. These results notoriously differ from other reports; i.e., for B. stearothermophilus glucose was found to be the most suitable substrate  whereas xylose and glucose were best for B. cereus , in cases also with addition of starch . All the starches tested resulted in good cell growth and enzyme production. The differences in enzyme activity obtained in media with various starches may be related to their physical structure, a trait that seems to be discriminated by the Bacillus species. Thus, Gawande et al  have observed maximum CGTase production with corn starch for B. firmus; Jin-Bong et al  reported better yields with soluble starch for B. stearothermophilus, while Sreenivasan et al  reported maximum CGTase activity when tapioca was used as carbon source for B. macerans. In this study, for B. circulans DF R9 significant increased CGTase yields were obtained with cassava and rice starches (Table 1). Basal medium containing 0.02 g/L MgSO4.7H2O, 1.78 g/L KH2PO4, 15.14 g/L K2HPO4, 0.02 g/L FeSO4 (pH 7.6) at 37°C with 2 g/L (NH4)2SO4 as nitrogen source was used when carbon sources were tested, and 10 g/L cassava starch when nitrogen sources tested. Microbial growth (and enzyme activity) was not detected in the presence of glucose, xylose, maltose, α or β-CDs as carbon sources. It was tested the influence of organic and inorganic nitrogen sources on cell growth and enzyme yield. As shown in Table 1, increased CGTase activity was produced when ammonium salt was used as sole nitrogen source. On the other hand, additional supplementation with organic nitrogen compounds, i.e., tryptone or corn-steep liquor, although improving cell growth, decreased CGTase yield. The same was observed when urea or yeast extract were added (data not shown). These results differ significantly from other Bacillus strains, which showed either repression of CGTase production by ammonium salts  or the requirement of organic nitrogen sources for growth and/or enzyme production . Our results agree with those reported by Jin-Bong et al  for B. stearothermophilus. The better performance displayed by ammonium salt as sole nitrogen source enables the formulation of a simple and defined medium for growth and enzyme production, avoiding complex nutrients with unknown ingredients. The influence of several mineral salts on cell growth and enzyme production is shown in Table 2. They were added into the basal medium, prepared in deionized water, either alone or in various combinations, at the indicated concentration (0.2 g/L). * Basal medium was prepared in deionized water and supplemented with 0.2 g/L of the corresponding mineral salt. For testing the effect of Ca2+, Fe2+, Mn2+, Co2+, Ni2+ and Zn2+ the basal medium was supplemented with Mg2+. Magnesium was found to be essential for bacterial growth and iron for CGTase production. Other cations, such as Ca2+, Zn2+, Mn2+ or Co2+, had no effect, neither on growth nor in the amount of enzyme activity produced. While other authors have also found magnesium to be essential for enzyme production [11, 21], the effect observed for iron has not been reported previously. A simultaneous optimisation for Mg2+ and Fe2+ concentrations indicated that, although essential, increasing their concentrations above 0.02 g/L did not result in increased growth or CGTase activity (p > 0.01, for n = 7 and α = 0.05 %). 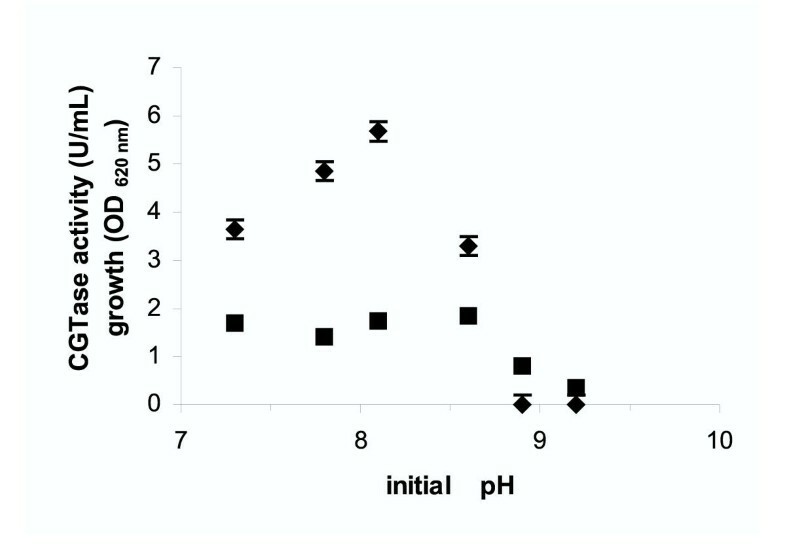 Cell growth was not affected between pHs 7.3 – 8.8, while CGTase activity produced in cultures was maximal at an initial pH of 8.3 (Fig 1). Effect of initial pH on growth and CGTase production. B. circulans was grown at various initial pHs in a medium containing 15 g/L cassava starch, 4 g/L (NH4)2SO4, 0.02 g/L MgSO4.7H2O, 0.02 g/L FeSO4, and different concentrations of KH2PO4 and K2HPO4. Symbols: OD620 (■), CGTase production ( ). Cultures of B. circulans were carried out at various incubation temperatures, from 32°C to 42°C. 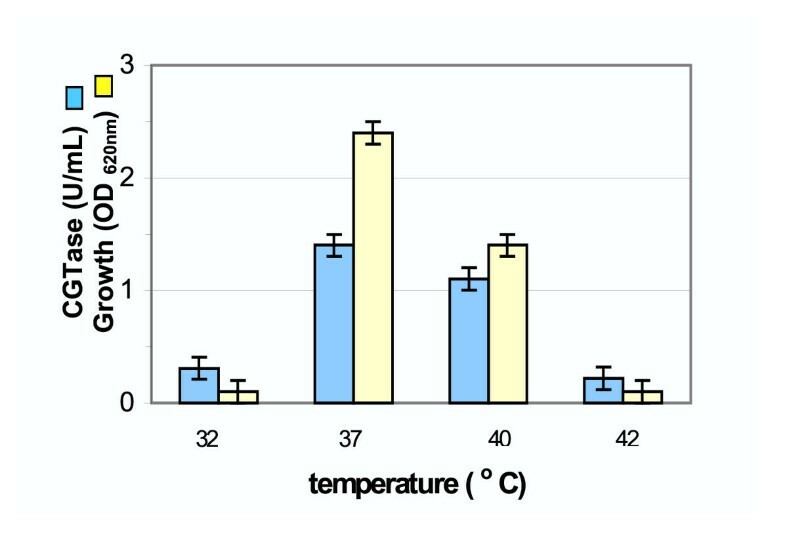 As displayed in Fig 2, cell growth (measured as OD620) and CGTase activity were maximal in cultures at 37°C. Nevertheless, at 40°C, enzyme activity was still high (80 % of the maximal value achieved) while growth decreased significantly (60 %). This behaviour suggests that CGTase may be fairly stable in this range of temperature. 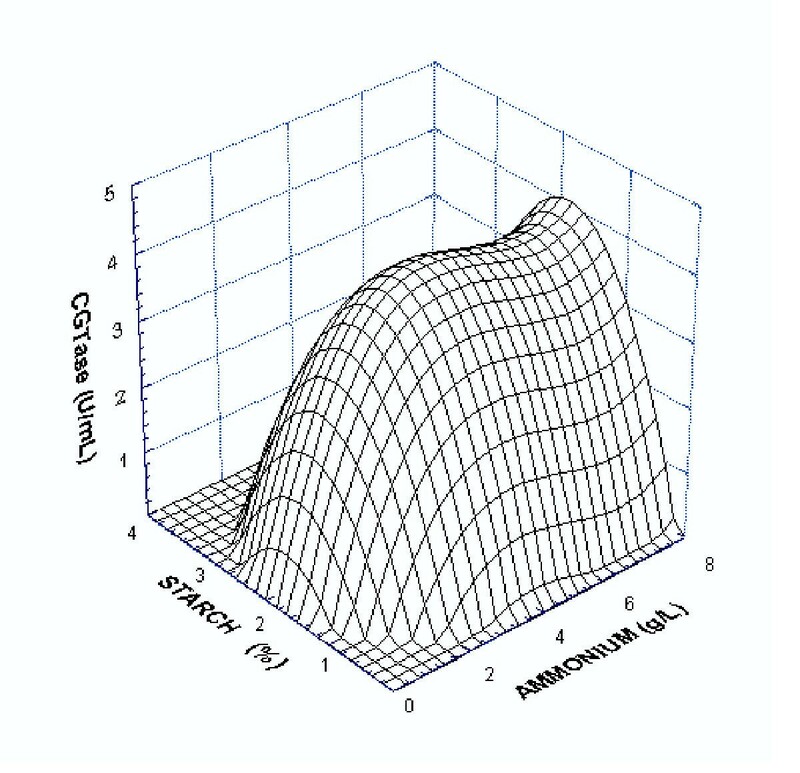 The effect of aeration was assessed varying the volume of culture medium in 250 mL Erlenmeyer flasks, at a constant agitation rate. As shown in Fig. 3, increasing the medium content in flasks above 50 mL decreased cell growth and CGTase yield. In a previous report, the addition of an extract prepared from fresh boiled potatoes in addition to starch was considered essential for CGTase production with B. circulans . In this study, using cassava starch as sole carbon source, we demonstrate that the ingredient can be avoided, thus simplifying medium formulation. 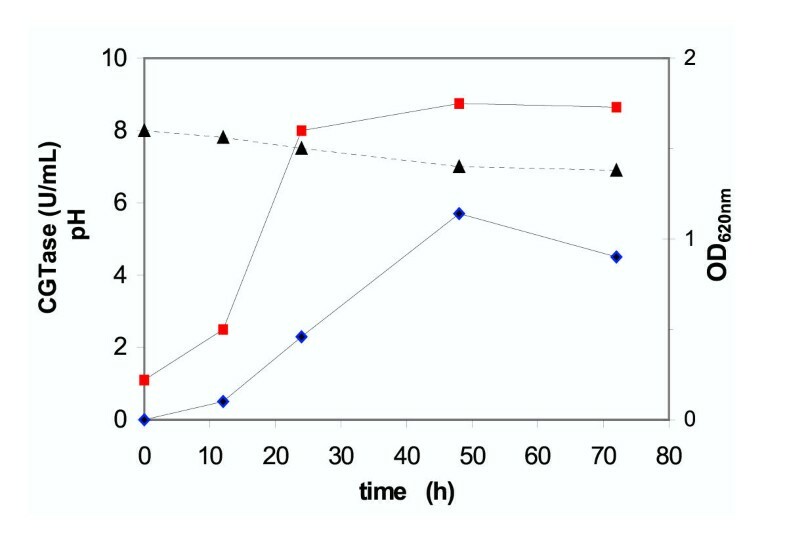 For this test, cultures with and without 2% potatoes water extract were compared during 48 h, in relation to maximal cell growth and CGTase activity. The results, submitted to ANOVA test, indicated that no significant differences were detected between both culture conditions (p = 0.169; n = 12; α = 0.05). The ingredient was therefore eliminated from the optimised formulation. The concentrations of the selected carbon and nitrogen sources, cassava starch and ammonium sulphate, respectively, were optimised in a central composite design experiment [16, 17]. Two independent experiments were performed for each culture condition, in order to calculate the standard error (S.E) in enzyme production (S.E = 0.28) the experimental design and results are displayed in Table 3. The concentrations of ammonium sulphate tested ranged from 1 to 7 g/L and the concentrations of starch from 5 to 35 g/L. Data for CGTase activity fitted best to an equation that lacks significant x/y interaction terms (i.e. the x, y3, x * y terms were discarded) based upon the ANOVA test and a regression analysis of the data. The plot in Fig. 4 shows a smooth surface, with an acceptable fit, with an optimum for starch concentration at around 15 g/L. This optimal concentration is in the range reported for B. circulans var. alkalophilus (10 g/L)  and for B. firmus (20 g/L) . The optimal for ammonium concentration, on the other hand, falls in a wide range, from 4 to 7 g/L, indicating that increasing concentration of this component is less critical for enzyme production. The medium composition that have been selected from this study consisted in 1.5 % starch, 0.4 % ammonium sulphate, 0.002 % magnesium sulphate, 0.002 % iron sulphate, 0.1 M phosphate buffer (initial pH 8.3). Time course of CGTase production for B. circulans displays a typical late-log production/secretion profile, not associated to growth. In effect, while maximal growth is attained at 24 hours and slows down later on, enzyme production increases sharply after on, between 24 and 48 hours culture (Fig. 5). Cell growth and CGTase production profile. Time course of CGTase production from B. circulans in shake flasks at 37°C in optimized medium containing 15 g/L cassava starch, 4 g/L (NH4)2SO4, 0.02 g/L MgSO4.7H2O, 0.02 g/L FeSO4, 0.1 M potassium phosphate buffer, initial pH 8.3. Symbols: OD620 nm ( ); CGTase ( ); pH (▲). This pattern has not been frequently observed, except for B. firmus . Most reports, on the other hand, have indicated growth-associated CGTase production processes  and biphasic profiles . We have screened conditions for B. circulans DF 9R optimal growth and CGTase production. The selected minimal medium contained starch, ammonium, Mg2+ and Fe2+ in phosphate buffer as essential nutrients. Incubation temperature (37°C) initial pH (8.3) and medium/ flask ratio (1/10 v/v) were also selected. In the optimal medium 5.8 U/mL CGTase are obtained in 48 h culture. As an additional advantage this medium does not require complex nitrogen sources. Bacillus circulans DF 9R was isolated from rotten potatoes in a minimal basal medium containing 1% soluble starch and 2 % potato extract  and maintained frozen at -20°C with the addition of 40 % glycerol. Potatoes, rice, wheat and corn starches were purchased from Sigma Chemical Co., Mo, USA. Cassava starch and potato extract were either from local suppliers or self-obtained. Yeast extract and peptone were purchased from Difco Laboratories Inc, while all other chemicals were of analytical grade from Merck, Darmstadt, Germany. A 0.5 ml amount of 24 h grown inoculum (OD620 nm = 0.3) was added to 250 mL Erlenmeyer flasks containing 50 ml of basal medium, 10 g/L soluble potato starch, 20 g/L potato extract, 2 g/L (NH4)2SO4, 0.2 g/L MgSO4.7H2O, 1.78 g/L KH2PO2, 15.14 g/L K2HPO4 (pH = 7.6), or modified basal medium (as indicated in each experiment) and incubated at 37°C on a rotary shaker at 100 rpm. Samples were removed at various time intervals for cell growth and CGTase activity measurements. For estimation of cell growth, each sample was appropriately diluted with saline solution and absorbance was measured at 620 nm. An aliquot was centrifuged at 20,000 g for 10 min, and CGTase activity was measured in the supernatant. The method described by Fuwa  was slightly modified for determination of CGTase activity. The reaction mixture containing 0.45 ml of 0.6 % soluble starch in 0.05 M acetate buffer (pH 5,5) and 50 μl of the enzyme solution was incubated at 40°C for 10 min. Thereafter, 50 μl of the reaction mixture was removed and added to 0.8 ml of 0.01 M iodine in 0.25 M potassium iodide, and diluted with 2 ml of distilled water. 50 μl of the reaction mixture was also added to the iodine solution before the incubation, and used as a zero control. Absorbance was measured at 660 nm. One unit of enzyme activity is defined as the amount of enzyme that produced a difference of absorbance of 1.0 per min. under the described conditions. In previous work it was shown that no other amylolytic enzyme is detected in supernatants, therefore all the activity should be attributed to the CGTase . The production of β-CD was determined by the modified phenolphthalein method of Goel and Nene . Here the α's are fitted constants and x and y are coded variables. The α's were calculated from the main effects and interactions or linear regression analysis with standard statistical software (Statistica for Windows, Release 4.2 Copyright StatSoft, Inc. 1993). Coefficients smaller than two times the standard error were presumed to be due to experimental error and were neglected. The central composite design was used to reach the optimum ratio for CGTase activity with the selected carbon and nitrogen sources. The strain was propagated in agar slants containing 2% soluble starch, 0.5 % yeast extract, 0.5 % peptone and 2 % agar, and incubated at 37°C for 48 h. A loopful of cells was transferred into 50 mL of the selected minimal medium and incubated at 37°C for 24 h at 100 rpm. This culture was used as inoculum. 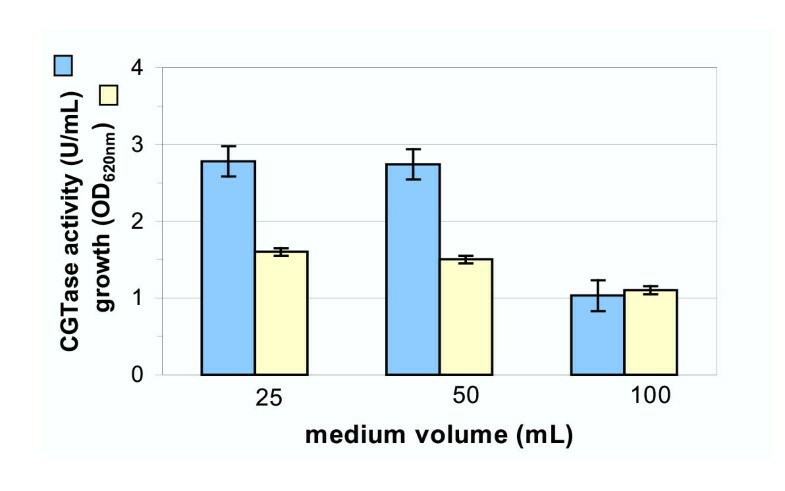 Time course of CGTase production was studied in shake flasks for 72 h. A 1% (v/v) inoculum, grown as described above, was transferred in 250 mL Erlenmeyer flasks and incubated in the same conditions. At least duplicate experiments were run for each tested condition. Samples were removed periodically and cell growth, pH and CGTase activity were determined in each sample, as stated earlier. The authors acknowledge the financial support of the University of Lujan. Author 1 initials carried out the experiments. Authors 2 and 3 initials participated in the design and supervision of the study. Author 4 initials conceived of the study, performed the statistical analysis and the coordination. All authors read and approved the final manuscript.